Hello Stampin' Sisters!! Thank you for joining us for the KITTIE KIT Blog HOP fun!! 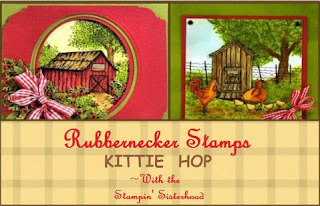 In case you didn’t know, Rubbernecker Stamps has a line of stamps called KITTIE KITS and they include a variety of images that can be used together in MANY different ways to create MANY different scenes!! The Stampin’ Sisterhood DT each has a creation today to illustrate some ways to use these stamp sets! There is a HOP ROUTE for you to follow below! Make sure to leave a comment at every stop to increase your chances of winning. I used The Cause a Scene set The Moose is Loose for my winter scene today. I stamped the log cabin, masked it, and then stamped the pine trees around it. I removed the mask and colored the cabin with Copics. 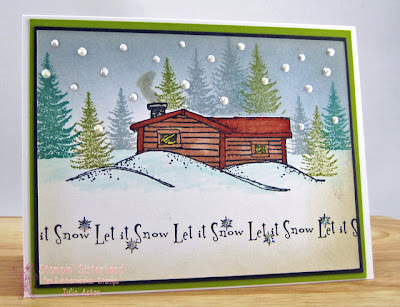 I stamped the Let It Snow sentiment across the bottom and sponged the edges with Old Paper ink and the sky with Weathered Wood. Then I added White Opal Liquid Pearls to the sky and Crystal Ice Stickles to the snow flakes in the sentiment. I also colored in some smoke coming out of the chimney with a grey Copic. I can just imagine how cozy and warm it feels inside this pretty cabin in the snowy woods! Be on the look out for our NEXT HOP coming in FEBRUARY!! We look forward to bringing you MORE sharing and prizes!! Until then, be sure to check out the daily posts on the STAMPIN’ SISTERHOOD blog!! There's LOTS of inspiration to be found every day! Here's the list for the hop - be sure you stop by each blog and leave a comment to increase your chances of winning a Kittie Kit Stamp set! You can see all the Kittie Kits here. Ink: Memento Tuxedo Black, Ranger Distress - Old Paper, Weathered Wood, Pine Needles, Iced Spruce, Peeled Paint. Accessories: Copics - T2, E13, E19, YG91, BG10, Y15, Liquid Pearls White Opal, Ice Stickles Crystal Ice, Eclipse Tape. Love your card. Great scene. I love how your trees are in the background - lovely card! Serene and beautiful, Julia! I love your falling snow around this terrific cabin image. I love your cabin scene!! Makes me want to snuggle up with a good book in front of a cozy fire. Your trees are terrific! Wonderful scene you created! I can almost feel the fire in the fireplace in that beautiful cabin in the woods. Awesomely created! This is such a beautiful winter scene, Julia...I can just smell the burning fire and feel the cold chill!!!! Love how you added the snow and the forest in the background, too...super cute!!!!! Julia, I love your winter scene. I especially love your creative use of different colors for your trees and your masking of the trees with your cabin. The Let it Snow sentment across the snow covered ground is perfect. OH....you know how I love falling snow! What a terrific winter scene! I am loving the cabin image, and you've put just the right stuff all around it. What a beautiful winter scene! I love the different colored trees and that tiny little cloud of smoke coming out of the chimney! Beautiful! Love the repeated sentiment along the bottom. Great log cabin scene! The falling snow adds just the right amount of sparkle to this fun card! Cute scene....love all the extra details! Great scene stamping! I love making snow scenes too, and the Kittie Kits have fabulous elements in them. I love all the tree designs! Julia, the different shades of the evergreen trees Made this picture. Great techniques and the smoke was a perfect finishing touch. This scene makes me feel like I'm right there with you - great job. What a great scene! Love that snow. Beautiful card. I'd like to be in that cozy cabin looking at those wonderful trees, watching the snow fall and knowing I didn't have to get out in it or shovel it. Really beautiful! Love the cabin in the scene. What a great scene. Love the cabin. Love this cute cabin, trees, and those wonderful big old snowflakes falling! Very pretty scene. Don't you just love Kittie's stamps...I know I do!!! I think I can even create a scene...I sure would love to try. Very creative. Love the snow! Wonderful snow scene, looks terrific. Wish I could be in that cabin right now! Love the falling snow. this is a work of art! love the snow-effect! The sentiment really sets off the snowy scene-great card. No snow here in Missouri as yet! I love your wintry scene! Fabulous card! Love the winter scene and the warmth of the cabin. Gorgeous. Love your cabin in the woods! Great card! This is beautiful! Love the scene you created. Your design is fabulous, Julia. This is stunning - this hop has been so inspiring! Lovely card...the snow sky is just the icing on the cake. Beautiful. Great scene. Love all those trees and the depth you gave them with the different colors/shades. Very pretty Julia, I love the snowflakes! I love this scene, Julia! Your masking is amazing and I love the coloring! Great job! I love the snow, the liquid pearls are neat. Such a pretty card. Oh, I know that cabin has a fire blazing in the fireplace!! All the details are wonderfully done! Love this winter scene! Nicely done! I'm really enjoying this hop as I have some of the Kittie Kits. This is one I do have, though I don't believe I've ever used the cabin images yet. Love your winter scene. Beautiful wintery scene, I love those trees, and the pearly snowflakes. The design is very pretty, with all these details. Such a pretty scene -looks so serene ! Quality articles is the important to invite the users to pay a visit the site, that's what this site is providing.